Left to right are Justices James V. Campbell, Benjamin Graves (standing), Thomas M. Cooley (center), and Isaac P. Christiancy 1868-1875. 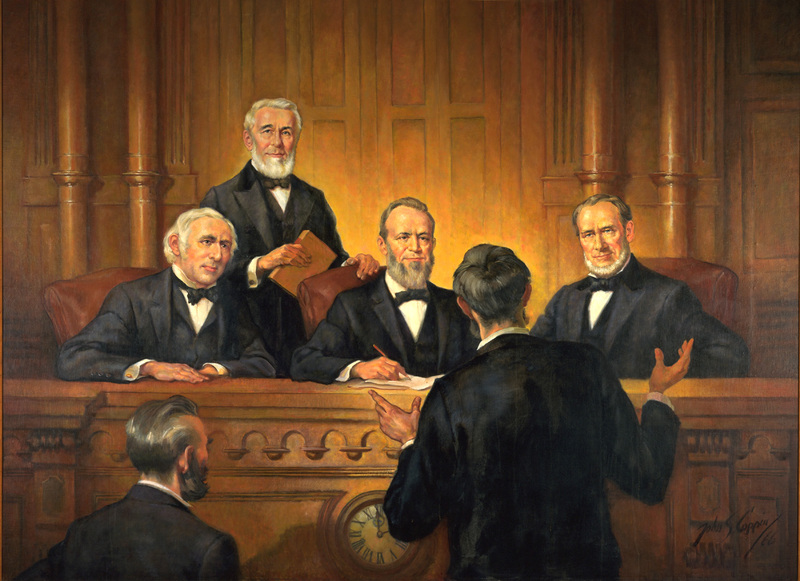 The portrait of the Big Four was painted a century after the justices began their service together. It was commissioned by Lincoln Park attorney Frank G. Mixter and his family and donated to the State Bar of Michigan. In 2005 the State Bar presented the portrait to the Michigan Supreme Court in a special session. You can read all about it here. Interestingly, then-Chief Justice Clifford Taylor spoke about The People on relation of Daniel S. Twitchell v. Amos C. Blodgett, which was also the topic of this year’s Annual Luncheon. Read his remarks to learn a bit more about the case. And as we start a new week, be encouraged by these words from Justice Michael F. Cavanagh, whose service to the people of our state on the Michigan Supreme Court rivals that of Big Four Justice James V. Campbell. Sometimes we let ourselves off the hook a bit as we think about those who have done very well in life. We like to imagine that they had some special gift that we lack. But there is a very striking element in the remarks that were made upon the deaths of each of the Big Four. As speaker after speaker rose to offer extravagant praise, many still made a very specific point of saying these men were not geniuses, that they were not unusually brilliant or gifted men. They were four hard-working fellows brought together by circumstance and history and asked to help a fledgling state begin to form its laws and traditions. They became heroes by doing the ordinary parts of their job with integrity and with energy. Who would the two gents be with their back to the artist, and looking at the four judges?